Is It Possible to Travel Into the Future or Past? Time travel is a favorite plot device in science fiction stories and movies. Perhaps the most famous recent series is Dr. Who, with its traveling Time Lords who whisk throughout time as if traveling by jet. In other stories, the time travel is due to unexplainable circumstances such as a too-close approach to a very massive object like a black hole. In Star Trek: The Voyage Home, the plot device was a trip around the Sun that hurled Kirk and Spock back to 20th century Earth. In the popular movie series Back to the Future, the characters traveled both backward and forward in time. However it is described in stories, traveling through time seems to pique people's interest and ignite their imaginations. But, is such a thing possible? In "Back to the Future" a specially outfitted DeLorean was the "vehicle" that took the movie's characters back and forth in time. Getty Images/Charles Eshelman. It's important to remember that we are always traveling into the future. That's the nature of space-time. This is why we remember the past (instead of "remembering" the future). The future is largely unpredictable because it hasn't happened yet, but everyone is headed into it all the time. To speed up the process, to peer further into the future, to experience events more quickly than those around us, what would or could anyone do to make it happen? It's a good question without a definitive answer. Right now, no one has built a working time machine to travel temporally. While it's not possible (yet) to travel to the future fast than the rate at which we're doing it now, it is possible to speed up the passage of time. But, it only happens in small increments of time. And, it has only happened (so far) to very few people who have traveled off Earth's surface. For them, time moves at an infinitesimally different rate. Could it happen over longer time spans? It might, theoretically. According to Einstein's theory of special relativity, the passage of time is relative to an object's speed. The more quickly an object moves through space, the more slowly time passes for it compared to an observer traveling at a slower pace. The classic example of traveling into the future is the twin paradox. It works like this: take a pair of twins, each 20 years old. They live on Earth. One takes off on a spaceship on a five-year journey traveling at nearly the speed of light. The traveling twin ages five years while on the journey and returns to Earth at the age of 25. However, the twin who stayed behind is 95 years old! The twin on the ship experienced only five years of time passing, but returns to an Earth that is much farther into the future. In much the same way that traveling at speeds close to the speed of light can slow down perceived time, intense gravitational fields can have the same effect. Gravity only affects the movement of space, but also the flow of time. Time passes more slowly for an observer inside a massive object's gravitational well. The stronger the gravity, the more it affects the flow of time. Astronauts on the International Space Station experience a combination of these effects, though on a much smaller scale. Since they are traveling quite quickly and orbiting around Earth (a massive body with significant gravity), time slows down for them compared to people on Earth. The difference is much less than a second over the course of their time in space. But, it is measurable. Could We Ever Travel into the Future? 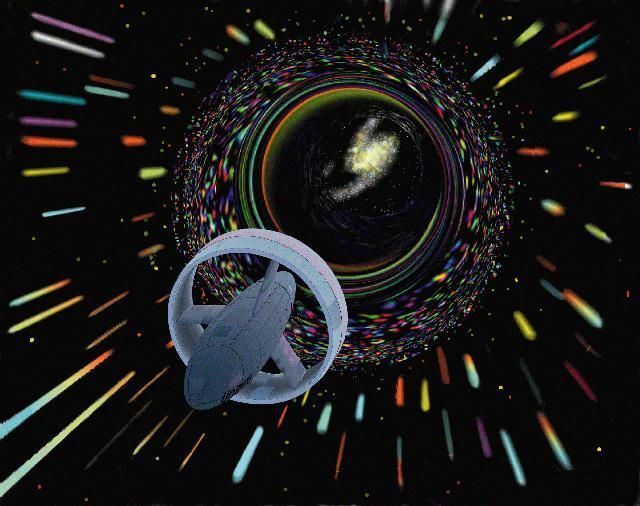 Until we can figure out a way to approach the speed of light (and warp drive doesn't count, not that we know how to do that at this point, either), or travel near black holes (or travel to black holes for that matter) without falling in, we won't be able to do time travel any significant way into the future. Moving into the past is also impossible given our current technology. If it were possible, some peculiar effects could occur. These include the famous "go back in time and kill your grandfather" paradox. If you did do it, you couldn't do it, because you already killed him, so therefore you don't exist and can't go back in time to do the dastardly deed. Confusing, isn't it? Time travel is a science fiction trope that may possibly be technically possible. But, no one has achieved it. We do travel into the future all our lives, at a second per second. To do it faster requires technology we don't have. Travel to the past is also impossible at the present time. Is Time Travel Possible?| Explore, www.physics.org/article-questions.asp?id=131. “Time Travel.” TV Tropes, tvtropes.org/pmwiki/pmwiki.php/Main/TimeTravel. Are Newspapers Dying or Thriving?